Smoothie bowls are all the rage these days. If you don't know what a smoothie bowl is, essentially you take the same ingredients you would put in an ordinary smoothie and add a ton of ice so that it becomes thick enough that you can eat it with a spoon from a bowl. You then add a variety of healthy toppings to the smoothie mixture such as additional fresh fruit, nuts, coconut flakes, cacao nibs, etc. but you don’t blend them into the mixture. You just leave them as toppings in their whole form. Here I share a recipe for my Acai smoothie bowl. Acai is a highly nutritious fruit that is native to South and Central America. It has a deep purple colour and is one of the richest sources of antioxidants (even more than blueberries) and flavonoids to help defend the body from free radicals. Additionally, they also contain calcium, iron, fibre and vitamin A. But the benefits of Acai berries don't stop there. In addition to its high nutrient content, they are also a low sugar fruit, hence are not very sweet. I don't quite know how to describe the flavour but some people feel they have somewhat of a chocolate taste. I'm not sure I feel the same way, however, it does partner well with chocolate. Two other interesting facts about Acai berries is they contain more protein per gram than any other fruit (8g per 100g) and they also contain essential fatty acids! Yes you read that right - it's not a typo! I know, it's a little surprising since fat is not something you expect to find in a fruit. Acai berries are a rich source of oleic acid, a monounsaturated fat, which is the same type of fat found in olive oil and avocados that has been linked to heart health. For this recipe, I use Sambazon frozen unsweetened Acai berry smoothie pack. Acai berries are not easy to find here in North America, however, you can find them in frozen concentrated form or freeze dried in powder or in a juice. I personally prefer frozen or freeze dried over the juice myself. For one, I don't know how fresh the juice is and fruits and vegetables start to loose nutrients when cut and exposed to air. For another, you the juice probably has added sugar since Acai berries aren't very sweet. 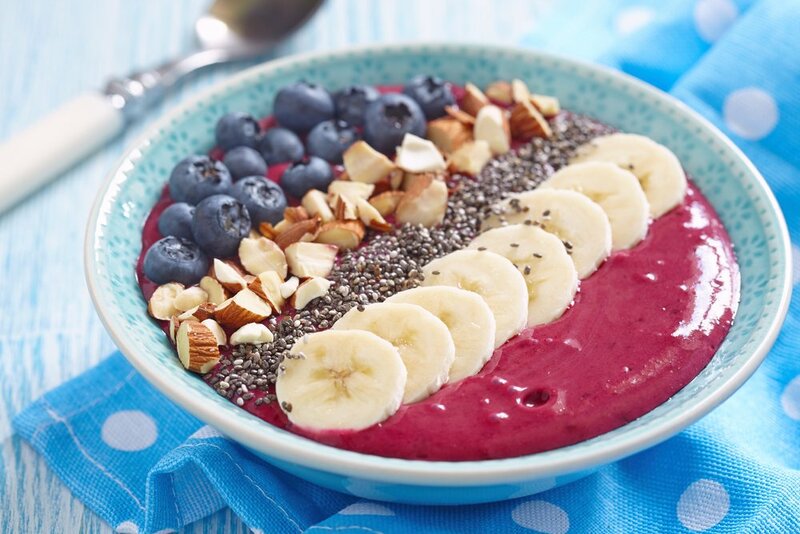 If you can't find Acai berries, don't worry, you can still make this smoothie bowl recipe using any other kind of fruit you want. A great substitute would be blueberries or blackberries. Blend Acai pack (or other fruit) with protein powder, banana, water and ice until you achieve a creamy and smooth but still thick consistency. Add more ice or liquid as required. Your mixture should be thicker than a smoothie – remember you are eating it with a spoon from a bowl. Spoon the mixture into a bowl and top with coconut flakes, oats, nuts, and berries (or any other healthy toppings you choose) and enjoy the healthy goodness!